Where are we right now? And what actually determines the Cycles for each sector? As it happens, most people believe every sector is quickly affected by interest rate movements. Whereas, that’s not strictly true. And where interest rates do have an effect … the actual timing of that also varies. The most sensitive sector is clearly Residential property. As interest rates rise, this immediately starts to curb homebuyer borrowing — which, in turn, thins out the number of people bidding at auction. And that quickly affects selling prices. Generally, about 3 to 6 months later, you’ll notice Retail sales being affected. And as a result, investors will tend to temper their demand for that sector. Because most Industrial property is largely used for product distribution … any fall in retail sales tends to decrease the need for storing additional stock. As such, the industrial market can then start to become affected — with about a 12-month time lag. [sam id=43 codes=’true’]Despite all the publicity about having an over-heated housing sector, the left-hand portion of this graph would suggest you are still a fair way off experiencing any collapse in the Residential market. During last year, homebuyers were more or less playing catch-up — as a result of effectively doing nothing since the GFC. And so, you are likely to see prices stabilise throughout the remainder of 2014. 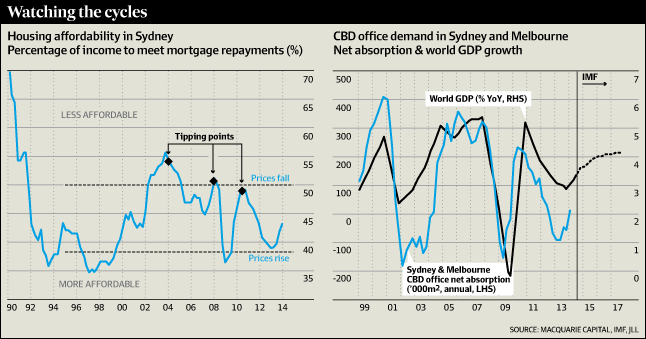 The right-hand portion of the graph confirms that the Office sector is basically unaffected by interest rates. Instead, you’ll notice that it closely tracks economic activity. And this is what then determines the supply and demand for Office space. Bottom Line: As a result of where things sit in the current Cycle, you should be enjoying good growth for Office property over the next 3 to 5 years — certainly in the Sydney and Melbourne markets. With a those markets expected to peak somewhere around 2018/19. Unfortunately, the other capital city Office markets appear to be running several years behind this timeframe. And so make your investment decisions with this in mind.